Pasta is usually my go-to ingredient when I want something quick and easy. 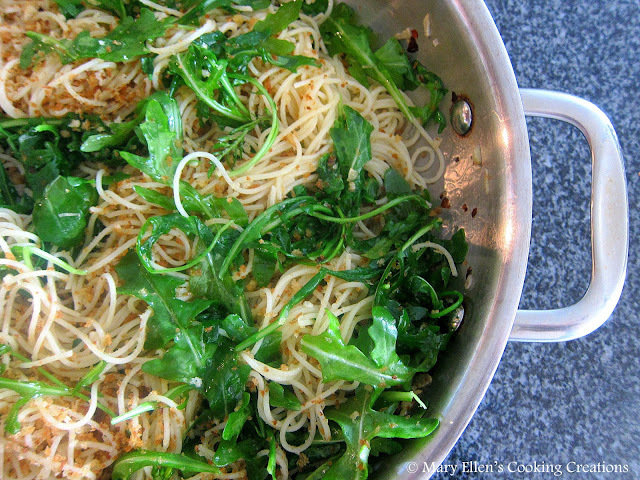 This one caught my eye because I love arugula, and the chili-garlic oil mixed with some lemon juice sounded interesting. Toss in some toasted panko for texture and it's pretty much perfect. In a large saute pan, combine the panko with 2 tablespoons of the oil and toss to combine. Toast over medium heat, stirring, until the bread crumbs are golden brown, about 5 minutes then transfer to a small bowl. In the same skillet, heat the remaining olive oil over medium heat. Add the garlic and red pepper flakes and cook for 4-5 minutes to infuse the olive oil. Right before you add the pasta (see next bullet), add the lemon juice and lower heat to the lowest setting. In the meantime, bring a large pot of salted water to a boil. Add the pasta and cook to al dente. Drain and add to the pan with the oil. Add the arugula and toss everything together. Season with salt and pepper to taste; add the toasted panko and top with Parmesan cheese. Serve immediately.